Welcome to The Box Seats, a hopefully regular feature where I discuss televised sports. The two things I love most in this world are sports and television. I especially like sports on television. My goal is to bring up some older sports events, games, telecasts, etc. and try to think about what they meant then, what they mean now, and whether or not our infatuation with sports has changed at all. This is going to sound ridiculous, but there are few days I remember better than Nov. 19, 2004. It was a Friday, and as we did so many Friday nights, a big group of my friends and I piled into my mom’s Pontiac Montana to go see a random movie. That night’s choice was the just-released National Treasure. After the movie, we went to Carlos O’Kelly’s, a mediocre Mexican chain restaurant that we all adored because they had half-priced appetizers after 9 p.m. and a high tolerance for 16- and 17-year-old idiots making lots of noise. After dinner, I drove the group home and we flipped it to the Indianapolis sports station WIBC to listen to the tail end of the Indiana Pacers–Detroit Pistons game. Pacers–Pistons had grown into a big rivalry after a grueling series in the Eastern Conference Finals the year before, a series won by the Pistons who then went on to win the NBA title. But the 2004–05 season seemed like it was set up for the Pacers, who were ready to take that losing experience, learn from it, and get healthy for a full-on title run. After years of coming so close (1994–95, 1998–2000 most notably), Reggie Miller had his best chance to win a title in what looked to be his final season. And even though it was still early in the season, the Pacers looked like they were on their way, and the game against the Pistons reflected that. In some bout of unfortunate serendipity, we flipped on the radio with about two or three minutes left in the fourth quarter and with the Pacers comfortably ahead, and having made a statement, we started talking over the telecast. But moments later, Pacers radio announcers Mark Boyle and Slick Leonard started to freak out about a scrum, leading me to half-assedly shush the van. 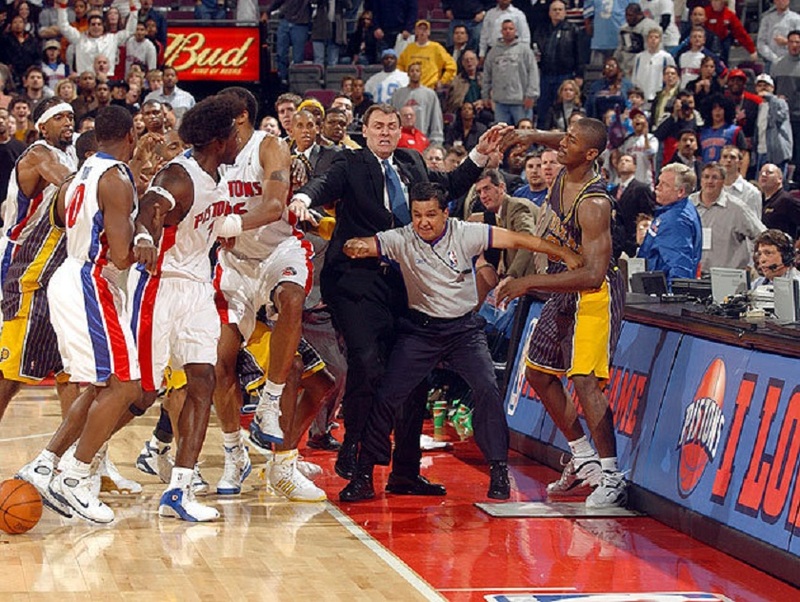 We sat there in silence as the Pacers’ Ron Artest fouled the Pistons’ Ben Wallace quite hard, leading to first a heated shoving match between a bunch of players and then, somehow, a full-on melee as Artest and other Pacer players jumped into the crowd to attack Piston fans who had assaulted them with bottles and cups. Considering we were listening to the Pacers radio announcers (oh, and that we were listening to radio), I assumed that we weren’t really getting the whole picture. It couldn’t have been as bad as it sounded, right? I quickly dropped off the rest of the crew and sped home to see some television coverage of the event. And find it I did, on ESPN, on Fox Sports Midwest, a little later all over the local news channels, and then everywhere for what seemed like forever. It turns out, of course, that the radio broadcast couldn’t do the hysteria justice. As bad as it was to listen to the madness on the radio, it was ten times worse to watch unfold on television. The Pacers and Pistons were chock-full of tough guys and they had played some physical games before, but the way Artest stupidly fouled Wallace and the way he even more stupidly reacted, it brought out something truly terrifying to watch. I’ll never forget standing in my dark living room, watching ESPN on near-mute as to not wake my snoring dad, as people got hurt and my favorite sports franchise basically imploded. Moreover, the “Malice in the Palace” broke down so many barriers. Obviously, Artest and company crossed the uncrossable boundary between the players and the fans. But with that, the players’ actions also deconstructed the illusion of what watching sports (both on TV and live, I guess) is “supposed” to be like. As viewers or fans, we want the “unexpected” to happen, but we also want to define unexpected within the typical rhythms of what we’ve seen before. The novelty has to come within the game and fit within the narrative concocted by both the media and our own minds. In 2004, everyone knew that Pacers–Pistons games were “physical” and that Ron Artest was “a little crazy.” But those air quotes signified that those meanings were directly associated with buzzwords and character types we’ve grown, with the help of the media, to associate with sports. The tension Pacers and Pistons—and any pair of opposing teams—was both real and “real,” just like Artest was happy to play the role of one of the NBA’s primary bad boys. And perhaps most importantly, fans were happy to view all it that way, so when the brawl happened, the lines got even more blurred in troubling ways. The physicality between the two teams and Artest and Wallace went from “part of the game” to something much more real, and yet, certain fans responded to the situation as if they were still playing along with the performance of sports. Ron Artest is the bad guy. He’s the guy we hate. Let’s throw stuff at him. Problem is, as soon as you as a fan cross that line, the players are fairly justified in crossing it as well. I’m not condoning what anyone did that night but no one is singularly to blame either (except for Artest when it comes to killing the Pacers, that’s just truth). In any event, more than physical boundaries fell that night. The organized chaos of professional sport became just chaos. The narratives and characters that were helped to life by the media were fulfilled and then taken to some powerful extremes. And the audience’s expectations of how the performance of sport was supposed to happen were subverted. As a fan, I had never experienced something like that before. I rooted for my team, despite certain players’ apparent deficiencies. But the horror of that event and the consequences it birthed were tough to swallow. The whole thing made the players seem so inherently human, so flawed, and so not like the characters in the typical good versus evil or right versus wrong narratives crafted for individual games or seasons. The grey area created by that event changed my perspective on sports and athletes forever. I’m more cynical now, but also more aware. I still feel like I lost something that night—not as much as players of fans there did, that’s for sure—but it was probably worthwhile to recognize that just because sports airs on television (or the radio), it doesn’t mean that it’s just like television—nor does it mean that the players are simply characters.